Anahita is a young Iranian woman who is in Paris during the time of Iran’s Green Revolution of 2009. She is obsessed with the events of her home country, and is following them through Twitter and YouTube. 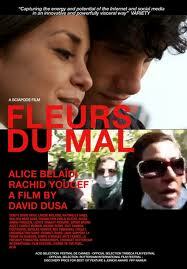 Gecko is a young man who works in the hotel where she first stays at in Paris. He is a livewire who cannot walk down the street without exploring his environment through dance. The two meet and fall in love, and Fleurs du Mal explores this affair through technology, dance and poetry. I found this to be a deeply moving film, although a warning should be given that many of the images from Iran are quite disturbing. It was unclear as to whether these were found images or were filmed specifically, but they had the brutal violence and chaos of the footage often seen on news reports of bombings and attacks. It is easy to love Gecko, the handsome young dancer with a lust for life yet sadness behind his eyes, and when the couple are so happy together, we want nothing to stop their romance. But it raises some tough questions – especially can one pursue happiness when friends and family are in danger? The film uses technology for communication, and I think it has been done extremely well. The footage from Iran is spliced in with the romance in Paris to show the conflict within Anahita, and the Twitter messages that occasionally appear on the screen tell more of what she is feeling that she herself can say.